Glass furnaces for blowing glass, kilns, glass casting and mould masking, glass grinding and sandblasting, materials delivery and storage, amenities and services for both artists and tourists are all accommodated with minimal alteration to the building. 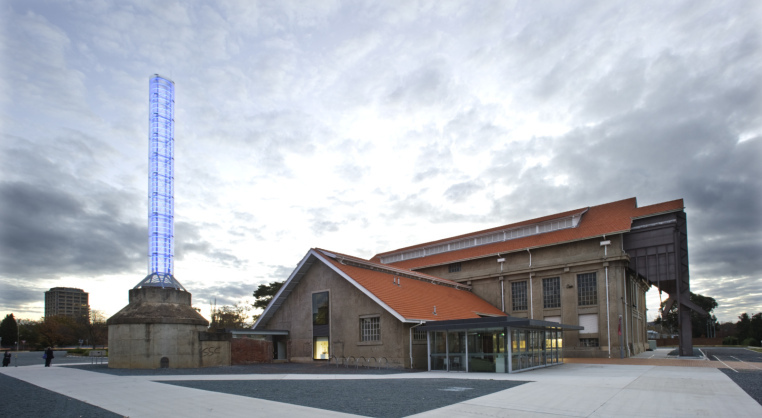 In establishing the glassworks, the ACT Government sought to position Canberra as Australia’s pre-eminent glass art producing area, thereby increasing the profile of the artists and generating cultural tourism. The project also aimed to demonstrate environmentally sustainable design principles, to conserve and protect the heritage values of the Kingston Power House and to interpret its cultural significance to the Canberra community. Prominently sited in the Kingston Foreshore development on the south-eastern edge of Lake Burley Griffin, the glassworks is the cornerstone cultural project in this new foreshore precinct. Download a printable version of the Canberra Glassworks case study (PDF 333 KB). Designed by Federal Government architect J. S. Murdoch, the Kingston Power House supplied Canberra with coal-generated electricity from 1915 until it was decommissioned in 1957. It was then used as a training facility by electricity authority ACTEW until 2000. Originally designed as a temporary steelframed structure, the power house was actually built as a substantial concreteencased, steel-framed structure. It is the oldest permanent public building in the ACT. When the adaptive reuse project began in early 2005 the power house was sound but neglected – it had not been maintained and there was much dirt, dust, cobwebs, graffiti and many pigeons. The plant had been removed but some switchboards remained. The steel coal hoppers were intact as they were fully built into the roof structure. The 2001 Conservation Management Plan by Peter Freeman Conservation Architects and Planners was the guiding document for the redevelopment. The power house and precinct is listed on the ACT Heritage Register. The industrial qualities of the power house, complete with its patina of former uses, was seen as an ideal backdrop for creative glass art production and workshops. The power house had formerly housed plant and equipment with few occupants. Achieving compliance with the Building Code of Australia for reuse as a public workshop accommodating glass artists, support staff and tourists presented a major challenge. Asbestos was found in demolition rubbish, in ash chutes, air dampers and as dust on the steel trusses. The reuse project began with a base building audit, a complete survey and further historical research. The adaptive reuse worked with ideas of difference and contrast. The mass, solidity, dull tones and monumental spaces of the power house were contrasted with the lightness, transparency, fragility, vivid colours and small scale of the art glass object. Accommodating new glassmaking facilities entirely within the existing building on a tight budget required careful design. Function was paramount, but the highly successful adaptive reuse strategy also maintains the spatial structure and physical fabric of the heritage building. The new industrial function of glassmaking has been carefully planned to respond to the way the building originally functioned. The main rooms on the upper floor – the former Boiler Room and the Engine Room – are retained as large, open spaces without subdivision or insertions. Funds were not available for general building refurbishment, so the building fabric has been left ‘as found’. Indents, holes and cracks in the concrete walls remain, as do conduits and the varying glass panes in the windows. New services are clearly expressed – new conduits sit alongside old; new duct work is exposed yet planned. This patina and layering recalls the building’s century-long history and former uses. No building fabric was removed unless absolutely necessary, including previous interventions and alterations, and everything possible was reused. Two large openings previously cut into the economiser walls form the new public entries; below-ground condensing pits now store rainwater and water for washing down the workshops; Oregon timber planks from the condensing pit walkways provide new seats in the Hotshop viewing area; heat from glass furnaces is reclaimed for heating water in the inslab heating; natural ventilation is optimised and windows automated. Existing windows are all retained allowing abundant natural light in the large spaces. facilities and amenities. The smokestack is remembered through the new glass and light tower by artist Warren Langley. Reusing this large, significant building within Kingston Foreshore development retains an important part of Canberra’s industrial heritage, while also lending character to the new redevelopment. Leaving the building fabric ‘as found’ was a cost-effective way to retain evidence of the former industrial processes and changing uses, while also providing a strong aesthetic contrast to the new use. The spatial qualities of the existing building are maintained and contrasting new elements inserted within. This allows the two diverse stories to be easily understood. Architect, heritage architect and interior designer: Tanner Architects. Client: artsACT. Landscape architect: Scenic Landscape Architecture. Structural engineer: Rogers & Jefferis (now Northrop). Services engineer: Rudds Consulting Engineers. Hydraulic consultant: Tennant Hydraulic Consulting Services. ESD consultant: Cundall. Building regulations: Hendry Group. Access consultant: Accessibility Solutions & Eric Martin & Associates. OH&S consultant: Robson Labs/Powersafe. Surveyor: Earth Tech Engineering. Project manager: Project Co-ordination.